Note: These recommendations apply only to the EpiPen® brand of auto-injector and are not substitutions for learning how to use one from a qualified professional. Teaching your friends and family about how to use your auto-injector is essential when you are at-risk for Anaphylaxis. If you are ever in a situation where you are unable to administer your auto-injector on your own, it is important that whoever you are with knows how to help you. For that reason, I always make sure that people who I spend a lot of time with know about my allergies, where I keep my auto-injector, and what to do if I have an allergic reaction. 1. Hold the auto-injector with the orange tip pointing downwards and remove the blue safety cap by pulling it straight off. 2. Firmly push the orange tip of the pen into the middle of the outside of the individuals thigh and hold for several seconds after hearing a click. I always instruct the individual that the auto-injector can inject through pants and to immediately call 911 after using the auto-injector. To ensure that the person understands, you can ask them to explain your instructions back to you. By teaching others about your auto-injector, both you and your friends can feel more comfortable about your allergies. 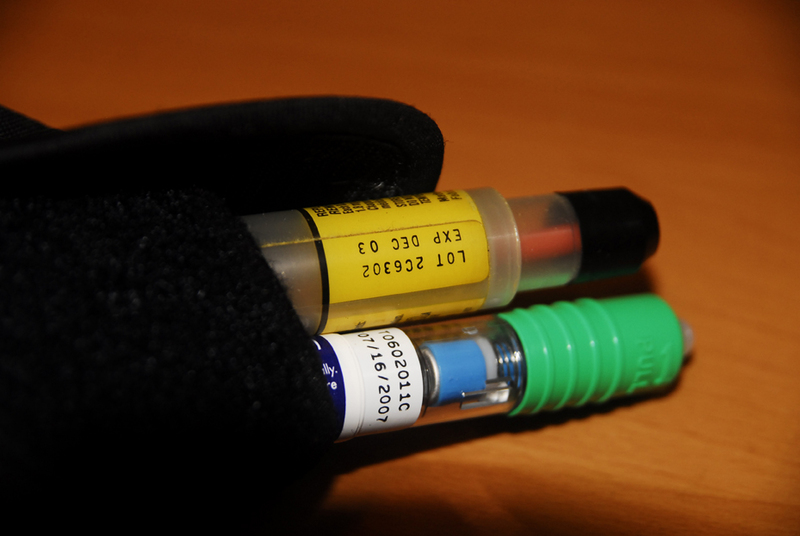 Allergies and the Buddy SystemAnaphylaxisAuto-injectorpersonal experienceSara S.
When I’m teaching my friends, family, colleagues about Epipens… I have a few things I always add to the above. 1) It doesn’t hurt any more than the best vaccination you’ve ever had. I totally FLIPPED the first time I had to actually use an epipen. 10 years of first aid training and prep hadn’t gotten me ready for a moment where I’d have to inject myself. I knew the steps but I was scared of what I essentially thought would be the biggest needle ever. Not so! Yes, it’s a long needle. But it’s super small diameter. With kids, I would stress the PEN part. 2) It helps SO much SO fast. Everyone reacts differently, but giving an epi sooner rather than later can be crucial. For me all my symptoms disappear 20 seconds after the epi. All the panic, all the chaos, just stops. Obviously there’s still the hassle of a trip to the ER, but hey- paramedics are usually very nice and often have a wicked sense of humour! 3) Better safe than sorry. Especially for my colleagues, I stress that giving me my epi is better than not. That is always the biggest hesitation my friends/colleagues/family express, so I try and stress the message every medical professional has ever given me: Epi is safe for me. Anaphylaxis is not.